Signal hints at possible interactions between ordinary hydrogen and dark matter in the early universe, but some scientists remain skeptical. (Inside Science) -- After spending nearly two decades listening to the skies with radio telescopes, astronomers have finally detected a long-sought-after and subtle signal from the early universe. A group of scientists claim to have found a sign of radiation from the very first generation of stars, only about 180 million years after the Big Bang -- just a blink of an eye to the cosmos. “Other than the cosmic microwave background radiation, this is the earliest observation of any kind in the universe. Compare it to Hubble looking at the first galaxies at 400 million years old; we’re looking at a time roughly half that age,” said Judd Bowman, a cosmologist at Arizona State University in Tempe, Arizona and lead author of the research, published today in the journal Nature. 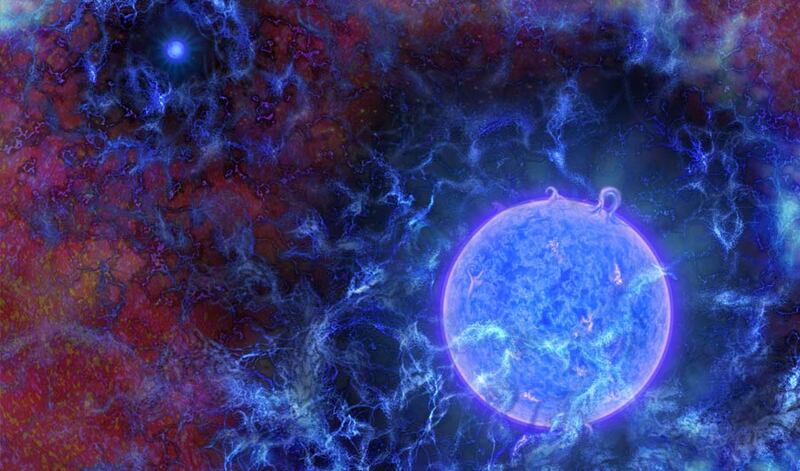 During an era known as the “cosmic dawn,” the first stars were forged from primordial hydrogen and helium gas. Their ultraviolet light reached free hydrogen gas in the surrounding regions, interacting with the atoms in a way that left a key signature in the radio spectrum from the afterglow of the Big Bang. Looking for signatures like this helps astronomers probe the early moments of the universe when it was first beginning to form its structure. Bowman and his collaboration, the Experiment to Detect the Global Epoch of Deionization Signature, dubbed EDGES, are looking for a faint signal that’s no more than a tenth of a percent of the total radio power reaching the instrument, making it tough to discern it from all the noise, mainly static coming from our own Milky Way, he said. It’s like trying to hear a friend calling your name in a crowded cafeteria -- you might not even recognize their voice, let alone figure out what they’re saying. But Bowman believes the team has taken the necessary steps -- such as reducing and modeling their uncertainties and calibrating their instruments properly -- to be confident their measurement is actually a link to the distant past. The existence of the signal isn’t a surprise, but its frequency is lower than expected, possibly indicating that the first stars and galaxies were somehow assembling very efficiently. More importantly, the signal’s strength far exceeds predictions, suggesting that the primordial gas was colder than astronomers thought possible given their models of the gas’s thermodynamics. “If this impressive measurement is indeed confirmed, then it says that something weird is going on,” said Rennan Barkana, an astrophysicist at Tel Aviv University who authored a companion paper in the same journal. Bowman’s observation requires an interaction that’s surprising, Barkana argued. “The whole question of how dark matter interacts is wide open, and there haven’t been many observational clues yet, so I would be open-minded,” he added. Cooling something, such as with an air conditioner, requires a transfer of heat energy. To cool the hydrogen, one would need something even colder, and Barkana suggests that slowly-moving dark matter particles are up to the task. Somehow the dark matter would interact with the hydrogen atoms only in this period of the universe, after everything had escaped the crucible of the Big Bang but before the gas had been heated by other stars. But for the cooling to work, dark matter particles would have to be much lighter than most physicists believe them to be. Vera Gluscevic, an astrophysicist at the Institute for Advanced Study in Princeton, agrees. “I don’t think it’s crazy, and if it’s true, this would be thrilling. I’m excited to work on figuring out what this is and verify if it’s dark matter. But we need to give it time and we need to make sure,” she said. Another possible explanation for the strong radio signal Bowman and the EDGES team discovered is that there’s more radio background radiation being absorbed, rather than the hydrogen gas being colder than previously thought. The current measurement doesn’t distinguish between these possibilities. Upcoming radio observations from the Low-Frequency Array, based mainly in the Netherlands, and the Hydrogen Epoch of Reionization Array -- known as HERA -- being built in South Africa could settle the question. To find out what really happened with stars and dark matter 13.6 billion years ago, it seems astronomers will have to wait at least a few more years. Editor's note: This story was updated at 1:30 p.m. on March 1, 2018 to correct the affiliation of Vera Gluscevic.